With the onset of machine learning capabilities, it's become easier and easier to train machines to detect minute and subtle changes. 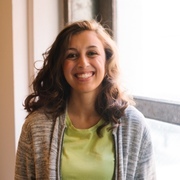 Recognizing a human face, for one, is something all of us are good at in varying degrees. However, recognizing and memorizing hundreds and thousands of faces in order to see if a missing person is found or if rescued people found under a collapsed building are related to anyone searching for them is very hard if not, near impossible. We thought that it would make sense to allow technology to step up and help out with reconnecting people to their loved ones. 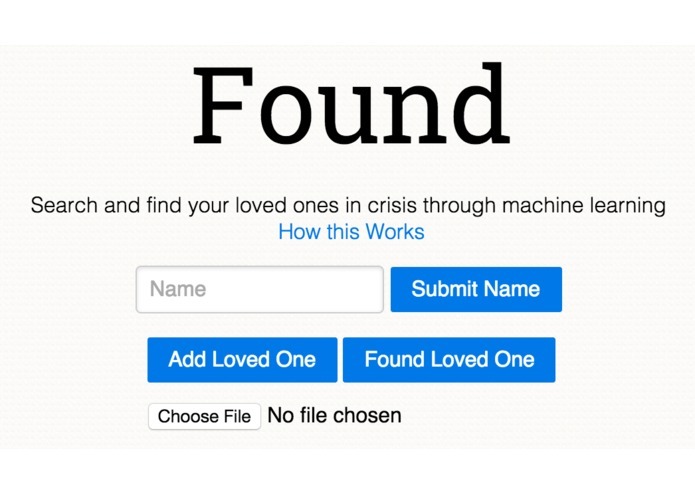 Found is a webapp that allows people to do two things. A family with a lost loved one can upload pictures of that person along with some basic information about the person as well as contact info. 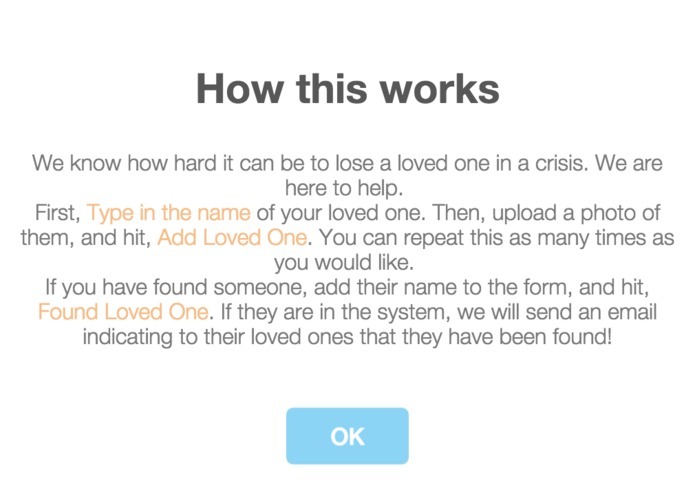 This will train the Clarifai API to memorize who that person is and if a match is found, an email can be sent to the family with the whereabouts and status of the loved one. Someone who is working at finding and identifying rescued people can take pictures of them and upload it to the web as well. This will help train the Clarifai API again and then if a match is made, email out to the family concerning the match. Since both parties will usually not upload them at the same time, one side will upload first to train the program while the other uploads in hopes of a match. Each party's respective location/contact information will be logged as well so they can be notified asap. This was built using Clarifai API to do the machine learning and image recognition, imgur api for image uploading, mandrill for emails, and BlueMix to deploy it all. At first, figuring out whether or not to use Sendgrid was an issue but since they don't support AJAX calls, we stuck with mandrill. Secondly, deploying to bluemix wasn't too easy either. But once we figured it out, it was a lot smoother than initially thought! We would like to incorporate GPS locations as well as better support for found and those unfound and aid those in rescue missions with a phone app to help them take pictures on the go. Families, friends, colleagues of individuals impacted by the disaster. First responders and backend support teams, including healthcare organizations. I deployed, did the email sending, and submitted to bluemix! I built the front end and integrated Clarifai!